Though it only sells smartphones, Apple represents nearly 8 percent of all worldwide mobile phone sales, making it the third-largest handset maker. Research firm Gartner on Wednesday announced its latest mobile device data for the first quarter of calendar 2012. It found that Apple's 33.1 million iPhones sold accounted for 7.9 percent of the total mobile phone market. Gartner's data represents worldwide mobile device sales to end users, not shipments. It should be noted that the 33.1 million iPhones that Gartner says Apple sold is off by two million from the 35.1 million Apple itself reported last month. Apple's share more than doubled from the first quarter of 2011, when the company sold 16.8 million iPhones and represented 3.9 percent of all mobile device sales, Gartner's data shows. The first quarter of 2012 represented a major shift in the market, as Samsung overtook Nokia, which had been the market leader since 1998, to become the No. 1 mobile device company in the world. Samsung's 86.6 million units sold took 20.7 percent of the market, while Nokia was in second with 83.2 million units, or 19.8 percent share. Gartner's research also concluded that Samsung sold the most smartphones during the quarter, with its 38 million besting the 33.1 million iPhones shipped by Apple. Apple's 7.9 percent share put it squarely in third place, well behind Nokia but still comfortably ahead of ZTE, which sold 17.4 million units in the quarter and took 4.2 percent of the market. In fifth was LG, which sold 14.7 million handsets for a 3.5 percent share. Huawei came in sixth in the first three months of 2012, selling 10.8 million handsets and earning a 2.6 percent slice of the market. That was enough to beat out seventh-place Research in Motion, which saw its market share fall from 3 percent in the first quarter of 2011 to just 2.4 percent in the same period in 2012, with sales of 9.9 million handsets. Motorola came in eighth, selling 8.4 million handsets and taking a 2 percent share, while Sony Mobile Communications was close behind with 7.9 million sold and 1.9 percent of the market. Rounding out the top 10 was HTC, which sold 7.7 million devices and represented 1.8 percent of the market. Total worldwide mobile phone sales in the first quarter of 2011 were 419.1 million units, which was a 2 percent decline from the first quarter of 2011, Gartner said. It's the first time since the second quarter of 2009 that the market saw a decline. The biggest gainers during the first quarter were Apple, Samsung and ZTE. 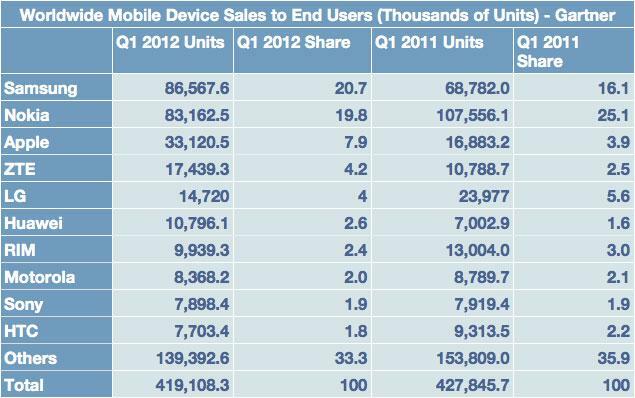 In addition to RIM and Nokia, Motorola, LG, and HTC all saw their share of the market shrink from the first quarter of 2011. Unsurprisingly, market growth is being driven by smartphones. Gartner found that there were a total of 144.4 million smartphones sold to end users in the first quarter of 2012, an increase of 44.7 percent year over year. Together, Apple and Samsung accounted for 49.3 percent of all smartphone sales worldwide, well above the 29.3 percent the two collectively represented in the first quarter of 2011. Among smartphone operating systems, Apple's iOS saw a year-over-year increase from 16.9 percent share in the first quarter of 2011 to 22.9 percent share to kick off 2012. Android also grew share in what has become a two-horse race, and represented 56.1 percent of smartphones sold to users. Nokia, which abandoned its own Symbian smartphone platform for Microsoft's Windows Phone, saw Symbian plummet from 27.7 percent of device sales in 2011 to just 8.6 percent in 2012. Those losses were not turned into Microsoft's gain, however, as its share of smartphone operating systems also dropped from 2.6 percent in 2011 to 1.9 percent in 2012. Research in Motion also saw its presence slide from 13 percent in the first quarter of 2011 to 6.9 percent in the same period in 2012. The only gainer outside of iOS and Android was Samsung's Bada platform. It grew year over year from 1.9 percent to 2.7 percent in the first quarter of 2012, Gartner found.